Aluminum Gloss Spray Paint, Exterior Grade, 11 Oz. 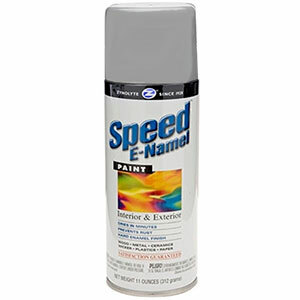 PRODUCT: ZYNOLYTE SPEED E-NAMEL ALUMINUM COLOR SPRAY PAINT, 11 OZ NET WEIGHT/CAN. PRICE/CAN. (HMIS 4 flammable ORM-D, UPS GROUND SHIPMENT ONLY). DESCRIPTION: Fast-Dry High Quality Finish. Formulated for EXTERIOR and interior. Creates a superior quality, tough, durable finish that PREVENTS RUST and dries in minutes. FEATURES: Zynolyte® Speed E-Namel™ provides excellent adhesion to all metal, wood and masonry surfaces. Good gloss and hide coverage. Protects metal and wood surfaces from rust and corrosion. Dry to the touch in 15 minutes. Get a smooth, professional finish every time. APPLICATIONS: Durable exterior grade spray paint. Excellent for furniture, metal and wood railings, fences, bicycles, hobbies, crafts, plastic and metal garden accessories, cabinets, doors, patio items, wicker, tools masonry, bulkheads, and much more. Can be used indoors or outdoors.